Lots of pieces to this particular campaign — I was given the task of creating a new look for this organization, using their logo and a few photos. Starting with a full page calendar ad, this campaign expanded to to posters and flyers, and ads of all sizes for a wide variety of publications. 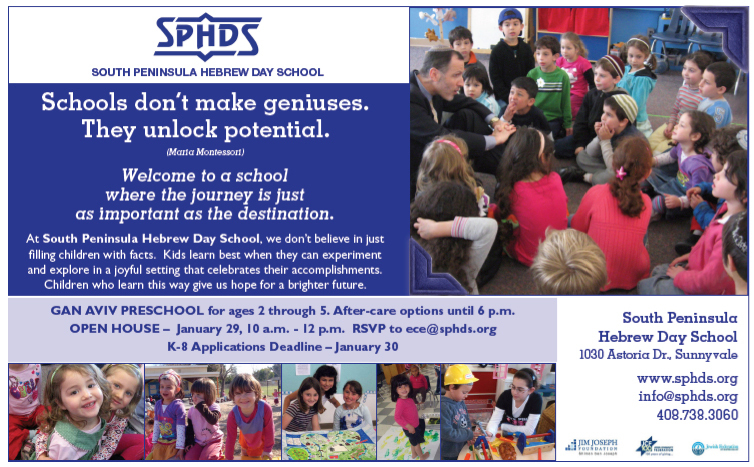 Shown is a sample ad from the many pieces for the South Peninsula Hebrew Day School. bar mitzvahs don’t have to be boring! A fun project and quick turnaround on these business cards and postcards for Arik Labowitz, spiritual leader extraordinaire…. 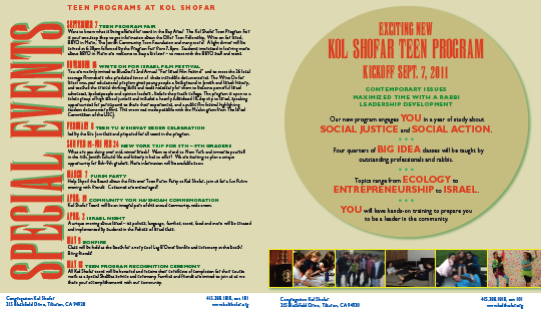 For the upcoming Mitzvah Fair in Berkeley. I’m sure that studying for Bar and Bat Mitzvahs with Arik is very fulfilling! Wonderful to work on such inspirational material! This looks like a fabulous series! Another Ruach Ha’Aretz retreat…. this tree of life is full of inspiration! 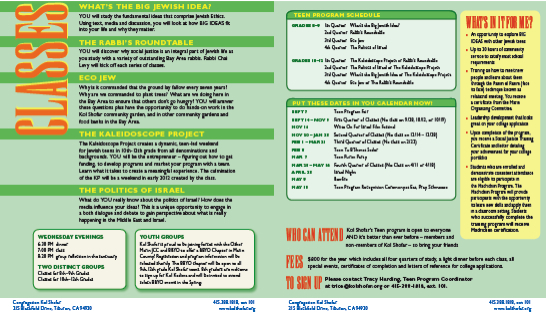 Just posted Kol Shofar’s Online Program Guide for Winter/Spring. Used bluetoad software – easy to use, reasonable price, good tech support…. all in all lots of happy customers! draidls, caneidls, and latkes, oh my! Time for a Chanukah post – the holiday starts tonight! Better get cracking on a new design. Ideas, anyone? Latke-land? Light in the darkness? Draidl draidl draidl? Stay tuned. In the meantime, I’ll post this special Chanukah zebra that a friend had forwarded to me. 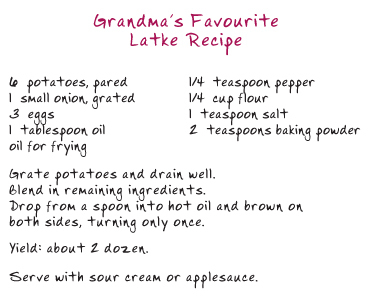 And here we go: my Grandmother’s Latke recipe, on my Chanukah latke cards. May the blast of the shofar bring with it a calling to consciousness, and a sense of cleansing, purifying, cleaning out – a readiness to move forward into the fresh new year. Shana – Year – is related to the Hebrew word for change. Chodesh – the word for month – is related to the Hebrew word chadash, new. Even the word shniya, second, is related to shana, year, and change. We have the opportunity for change with each year, with each month, and even with each second. May the blast of the shofar bring positive change.